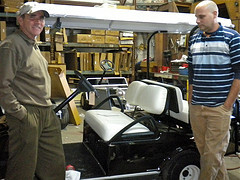 Refurbished golf carts provide significant savings over buying a new one. I had been looking at used electric golf carts for several months. We needed to move up from a 2 seat golf cart to a 4 seat golf cart - something about the grandkids loving to ride on it. That was fine with me, as long as a golf bag carrier is attached to the back. 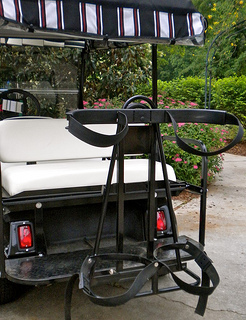 Here in Peachtree City, a golf cart community, they are easy to find. Although I've been happy with my Club car these past 15 years, I've been looking at used Yamahas and EZ Go Golf Carts. 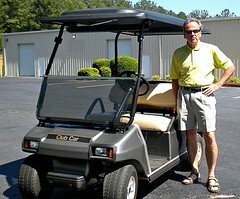 I like sticking with one of these three major golf cart manufacturers because it is much easier to repair well known brands or to replace parts. 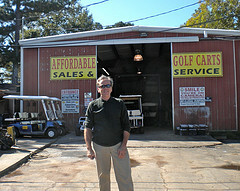 The two places to buy from are private individuals or used golf cart dealers. My wife and I spent several days over many months going to all the local golf cart dealers looking at refurbished and new golf carts. Most of our golf cart dealerships sell new, used and refurbished golf carts. 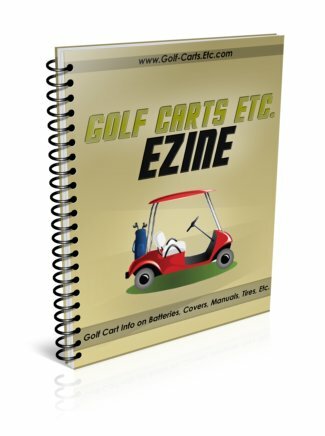 Used golf carts are usually golf carts that have been traded in by buyers who are wanting a new cart. They are sold as is without any changes made to the batteries, wiring, seats, body, etc. 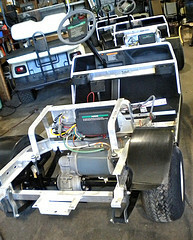 Refurbished golf carts are used electric golf carts from golf courses that have upgraded their fleet. The dealer then refurbishes them and makes them almost like new. I started considering buying a refurbished golf cart when I found that private individuals were listing their 2006 golf carts for the same price as a refurbished one. But of course the used electric golf carts from individuals all had used parts, the only new thing about the cart may be the batteries. 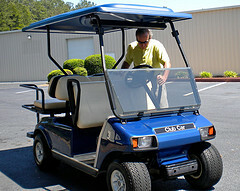 A refurbished golf cart is like getting a new cart but at almost half the price of a new one. That is if you decide to use Affordable Golf carts. They only refurbish Club Cars which is my favorite golf cart manufacturer. Dean says there are too many problems with the Precedent golf cart - these carts don't have a full frame, whereas the DS models have an all aluminum frame. What I liked about Affordable Golf Carts is that they get their carts from golf courses in the north east - where the carts have less rounds of golf on them - and so are "less used" used golf carts. Another reason why golf carts from this local are preferable to used golf carts from Florida is that they haven't had the constant exposure to salty air which causes damage and corrosion. When Affordable gets the carts, they strip them to the frame and then acid wash them. New tires, new brakes, new batteries, new back seat, new charger, new seat covers, new extended top, new lights and a custom pain job means an almost brand new golf cart for half the price. Dean warranties the golf cart for 1 year - parts and labor. The owner, which would be me, is able to pick out any color paint out of thousands of options - I chose a black with lots of metallic in it called Black Crystal Pearl. They also warranty the golf cart bumper to bumper - one year parts and labor. The first thing the guys at Affordable do is to strip the golf cart to it's frame and acid wash it. Then they start inspecting and replacing parts. Normally other golf cart dealers tape off the golf cart body to have it spray painted, while Affordable actually removes the body which makes for a better paint job. 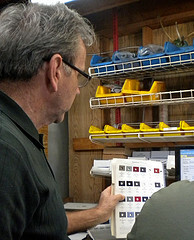 The new owner gets to pick out the color of the golf cart body. With over 1500 colors to choose from, I decided on Black Crystal Pearl. With lots of metallic flakes it has a chameleon affect meaning it takes on different looks depending on the light that's reflected on it. Here is a list of things a used golf cart dealer may do when they refurbish golf carts (which does not mean all of the dealers do all of these changes). A refurbished cart comes with a warranty. The warranty may be different with different dealers, but a typical one will include a one year warranty on batteries, rear differential, the engine, and the brakes. Consider a refurbished golf cart if you want to save some money. Most of the local dealers were offering these carts in the $3,000 range while new golf carts are in the $6 - $7,000 range. I promise to use it only to send you Golf Carts Etc. E-Zine.